Jacob was running for his life, what if that trauma has been communicated to us his descendants through our genes? In this sense, things that happened to our ancestors actually indicate things for us their children. 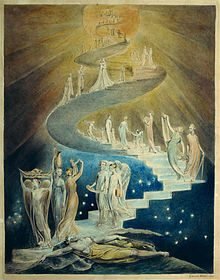 It really gives new meaning to the image of Jacob’s Ladder itself looks like the double helix ladder of atoms that make up our DNA. While we are often depicted as a religion it is clear that we are also a people; it is in our very kishkas.